Love Island viewers have been left unimpressed with a ‘joke’ made on the show. The 2018 series is now well under way, and there’s been plenty of drama on the show (so I’m told), and there’s no sign of it slowing down, it seems. Plenty of people have been reeling over an apparent ‘joke’ which was aired on last night’s episode, June 29. The ‘joke’ didn’t actually come from any of the contestants, but from comedian Iain Stirling – the narrator of the show. Stirling made the joke in response to Dani Dyer telling the camera her love life ‘is like a car crash’. It always happens, doesn’t it. You’ve started getting on the way to your fairy-tale and then there’s a massive car crash and that’s it. I don’t want that to happen, I want to stay in my car and head off into the sunset. That’s my favourite fairy tale, the princess and the car crash. It’s unclear whether he knew what he was doing, but I can’t imagine it was a dig at Princess Diana, just simply a sarcastic comment following Dani saying her ‘fairy tales’ end in a ‘car crash’. skdjfdjjdfjajfjfjdjfsjdh Iain Stirling making a Princess Diana car crash reference on Love Island ??? That narrator on Love island said his favourite fairy tale was the princess and the car crash ? Did anyone else think the commentator on @LoveIsland comment about princess and car crash was a bit distasteful? ? Iain hasn’t responded to any of the tweets, at the time of writing, but we’ll see. Now I don’t know if you’ve noticed, but Britain seems to be completely gripped by both the World Cup and Love Island. It’s the World Cup for me, and then the TV’s off. But millions of people have found themselves facing the tough decision of whether to watch the latest match, World Cup highlights, or check in to see what the latest is among the islanders. Some friends and I were having drinks after work and keeping an eye on the very exciting Spain v Portugal match. 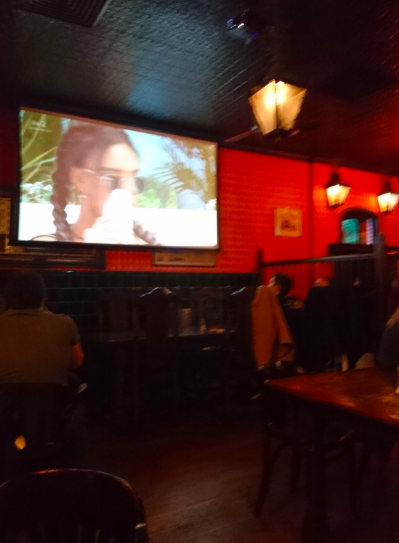 When it ended I asked if the pub if it would put Love Island on so I could see it. They said that if they had that channel then why not. My friends were teasing me for watching it and I found it really funny. This is the first series I’ve watched but I do enjoy it. The World Cup is also great and there’s a fun atmosphere when the big matches are on. I support England, originally being from there. I’m not sure too many people noticed Love Island was on but no one seemed to mind. One way to settle it! Love Island is on ITV2 Monday to Friday 9pm, and Sundays at 9pm.